If you think you might use more than one President get this image for just 15 cents in the President Bundle of all 45 Presidents for just $13.50! Cordial Clips offers this easily reproduced, black and white, royalty-free Portrait of Barack Obama, rendered in a realistic style. 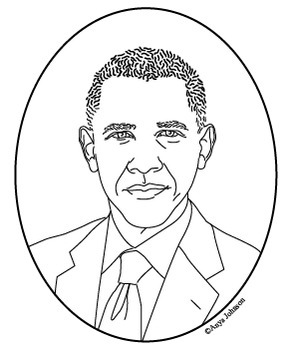 The first fits and 8.5x11 piece of paper and includes the caption: "Barack Obama, 44th President of the USA" This file could be used as a coloring page or small poster. It has a resolution of 300 dpi - perfect for high quality prints. The second .png is a version of the same image at 25% of the larger one, without the caption. It could be used on worksheets, in projects, on flash cards, etc. It is also a 300 dpi image. Suitable for print or web reproduction.